Most of us remember our first proper bike. It's a rite of passage, symbolising our transition from "little" to "big" kid. Even more exhilarating is the day we take our first ride without stabilisers. What most of us don't realise is just how complex the art of riding a bicycle actually is. So complex, in fact, that researchers are just beginning to investigate how on earth we manage to propel ourselves, constantly rocking back and forth with the movement of our legs, on two skinny wheels; simultaneously navigating movement in multiple planes while trying to avoid countless obstacles. Astonishingly, however, this patient could still ride his bicycle. Flawlessly.Video evidence, submitted with the published case study (and now available on YouTube), shows the patient, with severe tremors in his arms, shuffling slowly and unsurely down a hallway while being guided by another individual. After several steps he begins to stumble forward until he falls to the ground. "Riding a bicycle involves continuous use of all the human's primary sensory capabilities, visual, vestibular [balance] and proprioceptive [the awareness of one's body and limb positioning]," says Hess. "The latter involves sensors in the arms providing information about steering inputs. 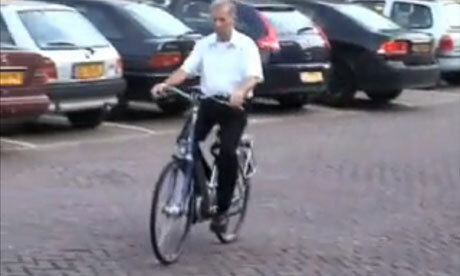 What is more interesting though is the ability of the trained cyclist to ride a bicycle 'hands-free'." What is clear from research into both the human brain and the bicycle is that despite the bicycle's simplicity we have yet to fully understand how it is that we manage to control it, and what is happening in the brain when we do. Our first wobbly bicycle ride, then, is a more remarkable event than we ever imagined.